Well, those who keep track on my reviews, or better yet, on the compilation releases by [walnut + locust], knows already that the conceptual ideas behind the many compilations released by this label are always successful and logical. Luminance is no different as well. It offers six different tracks that create together a drifting, somnambulist array that marks this mini album (3″ CDr, like most other compilations by this label) as a dreamy exhibition of sights and sounds. Opening this compilation are HTRK with “Suitcase”. Their sound, disrupting the fabric between shoegaze and post rock, gives the right idea about the rest of the album’s contents. The song in itself, is hypnotic, with a line of bass that penetrates the consciousness, a drifting, distant guitar that immerses the ears with gentle sounds, and of course, a gloomy but somehow comforting singing voice. .cut and Gibet begins with an oriental setting for their music. The guitar builds a world from tiny tiny sounds, sewn together over voice samples and electronic sounds. It leads, almost without me noticing, to HRSTA’s track, which takes us deep into infinite space with distant, meditative drones. Cloudscapes drifts off from this state of mind, with deeper blows in the horns of interstellar drones, and surprises with several interesting developments during the short track. Soporus offers a more intense track, with an ominous wall of raging howling and rising sounds. 2:Frail ends the album with a gloomy song, appropriately called “As the whale weep”, bringing to mind bands like Joy division and more recent groups like iLiketrains. The song, very good unto itself, closes the album in a great way, taking us back to where the album had started. 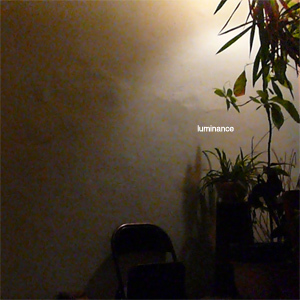 Like I said, every [walnut + locust] release offers a concept, and those who are interested in the dreamy and somewhat gloomy will find great comfort in Luminance.